This pizza is amazing! 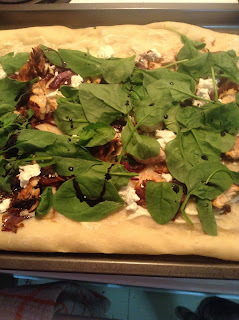 It has some of my favourite food combinations plus with the addition of a balsamic reduction I was in pure food heaven. Recently I have been on caramelized onions and balsamic vinegar kick. I just think all things can be made better with one or the other. But together they shine. 5. Grill chicken breast until cooked through. Once finished cooking cut or shred into bit sized pieces. 7. 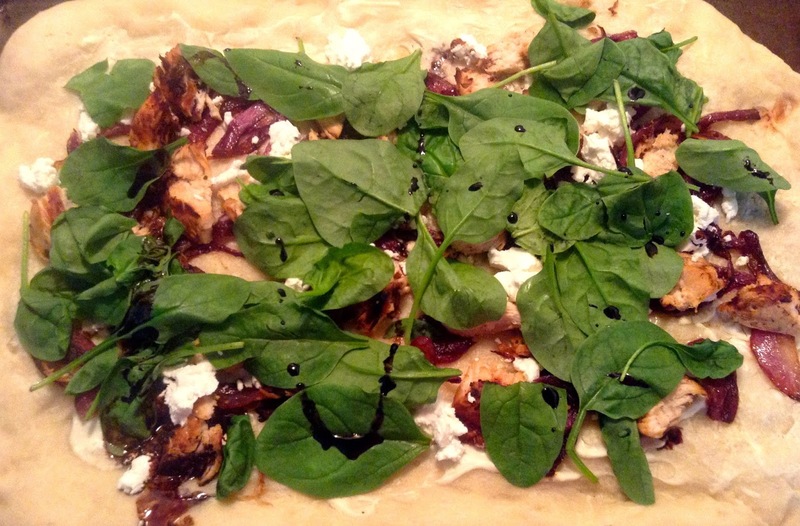 Once crust has pre-baked. Spread milk and goats cheese mixture in an even layer. Then add caramelized onions and chicken. Bake for another 10-15 mins. 8. 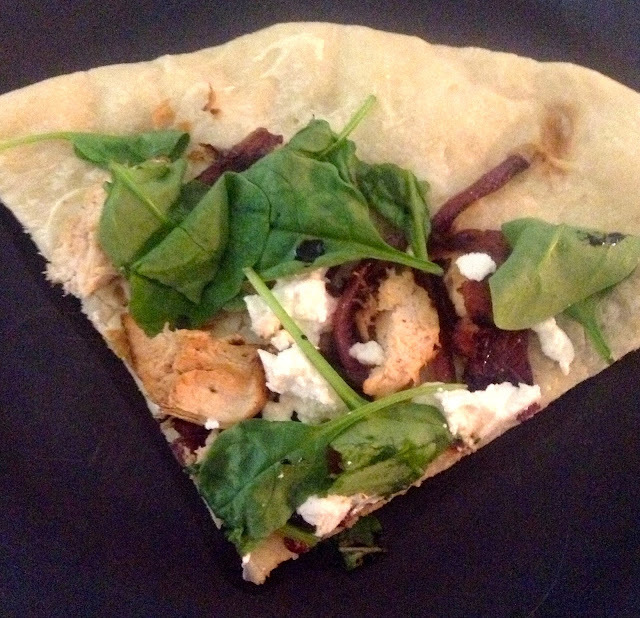 Remove pizza from oven top with spinach and crumble remaining goats cheese over pizza. Heat in oven for an additional 1-2 mins or until goats cheese is soft. 9. 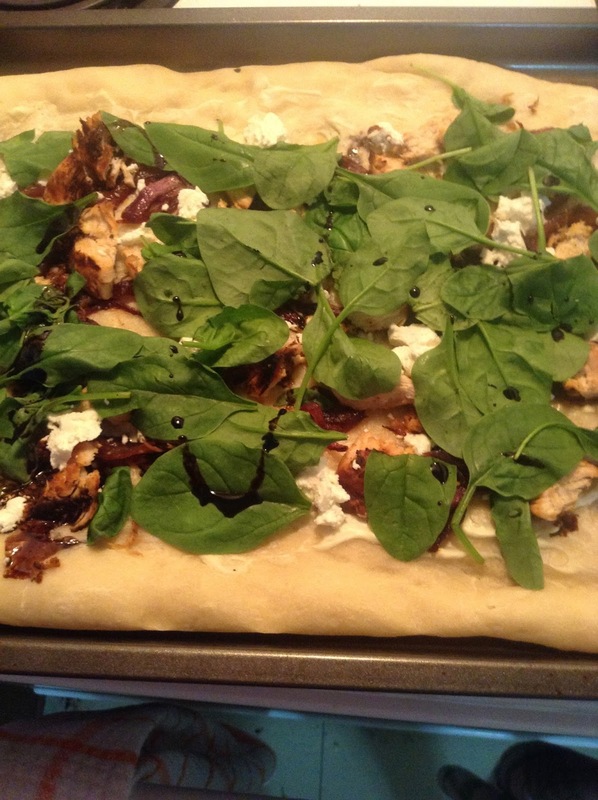 Drizzle with balsamic glaze (directions below) if you so desire. For the balsamic glaze: In a small sauce pan heat about 1 cup of balsamic vinegar. Do not let it boil. Once liquid has reduced to about half remove from heat and it will thicken further. Pour into a small dish for serving. Drizzle over pizza and enjoy!